I almost forgot to write the June Newsletter! I can believe tomorrow is the first day of June! Where did May go? May was a wet month here at the Shop. My paws are still damp from all the rain. And it's still pouring down rain, thunder storms & pea size hail today. Moda, I thinks gets annoyed at having to go outside when it's wet. I don't mind it. I hear rain water is good for your fur. It's supposed to make it soft. I think the ladies love it when my fur is soft. Which means more attention and scratches. It's been too quiet around the Shop lately. There isn't much news to pass on. With June comes the Row by Row Experience, starting June 21st. The theme this year is "On the Go". Mom & Grandma designed our Row to depict our area. 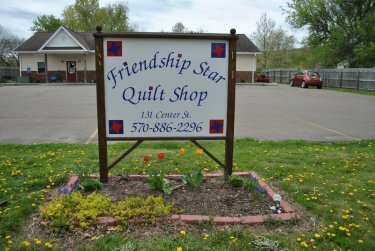 Since we are located between 2 rivers, the Chemung and Susqehanna (my original shelter name, by the way). We designed our Row around the river and the boating, canoeing & kayaking that you see happening every Summer. Our Row is called "Floating down the River"
You will have to wait until June 21st to get the pattern and/or buy the kit. We hope Rowers will like our Row this year. All classes are on a Saturday. 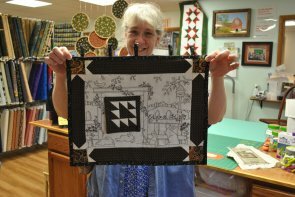 Get a free pattern and learn how to make the block. Door prize and free refreshments. Can you divide 3, 4 and 4? You can do it! We do have a little Show N Tell this month! 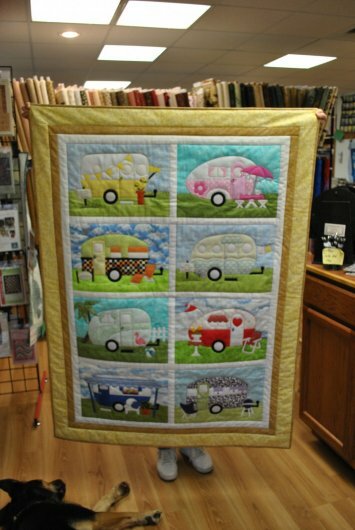 Lois E. made this fun camper throw. I thought it was a good time to get into the photo shoot. 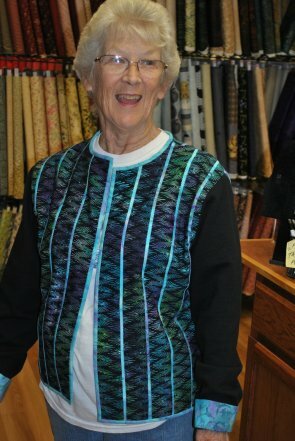 Lois E. modeling her finished sweatshirt jacket she made at our Sweatshirt Jacket Class. We think it's fabulous! We love the fabrics she picked out. 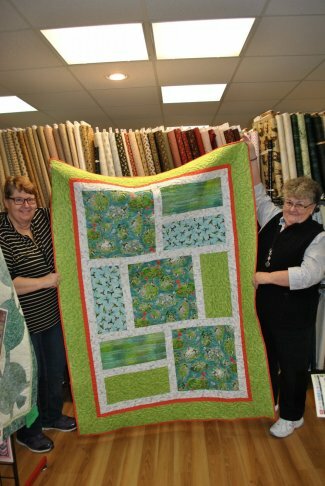 Ruth C. made this beautiful quilt using fabrics she bought here at Friendship Star Quilt Shop! We love it! It shows a great way to use large print fabrics. 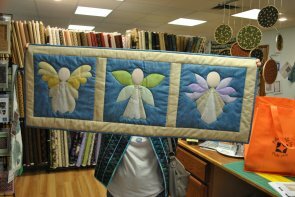 Another beautiful wall hanging by Lois E. We love her angels! This neat little wall hanging was done by Carolyn P. It is the Summer pattern of this series. is hanging on the wall hanging. Each season has a little quilt that you make and hang on it. That's all I have for you this month, folks. I hope you enjoyed my little newsletter. Have a great month! We hope to see you stop in.